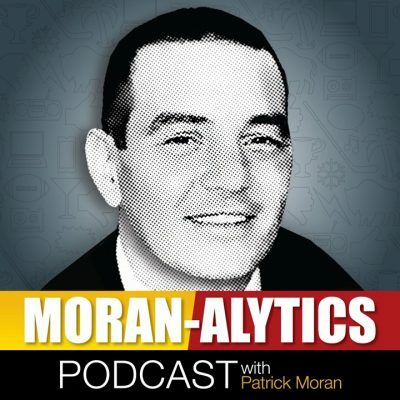 On this episode of the Moran-Alytics Podcast, Patrick Moran interviews the all-time undisputed king of sports agents and the real-life inspiration for the 90’s Hollywood blockbuster Jerry Maguire. Leigh Steinberg is today’s featured special guest. He’s represented and guided the career of more than 300 professional athletes, including a mind-blowing 63 former NFL first-round draft picks and a record-shattering eight consecutive years of representing the top overall pick of the draft. Leigh discusses his business approach towards being an agent and how it helped him attract clients like Troy Aikman, Steve Young Warren Moon, Oscar De La Hoya, Lennox Lewis, Ben Rothlisberger and a pair of Buffalo Bills Hall of Famers, Thurman Thomas and Bruce Smith among countless others. Steinberg (@leighsteinberg) also talks about debating Ronald Regan when he was young, why he was interested in becoming a sports agent, why it’s so important for his clients to be entrenched in their communities and to give back, his comeback from alcohol and personal demons, and offers advice to youngsters looking to break into sports management. Of course, we also talk about the famous Steinberg-inspired 1996 Cameron Crowe movie Jerry Maguire starring Tom Cruise as well as some other Hollywood hits Steinberg’s consulted on, including For The Love of the Game, Any Given Sunday and Arli$$. Immediately after that, Moran’s joined by Tone Pucks for “Pat with Pucks.” Today they’re discussing the abysmal showing by the Buffalo Bills in their regular season opening 47-3 loss at Baltimore. Are the Bills really this bad? Is the Nate Peterman era over already? Is Kelvin Benjamin the most overrated player on the Bills roster? Why was Vontae Davis inactive? All these topics and more are covered by two guys seemingly flabbergasted over how bad the Bills looked in Week one.